Last week I gave you some useful Windows tips; this week I thought I'd continue the tips theme, and move to Microsoft Word. Most users know how to use the Cut/Copy and Paste commands. They've been around since the early days of word processing, and they're universal across almost every Windows application and Windows itself. A lightning refresher: Select some text, press Ctrl-X to cut or Ctrl-C to copy, put your cursor somewhere else, then press Ctrl-V to paste. What could be simpler? Actually, when you're copying from a Web page, things get a little complicated. That's because although it looks like you're copying a chunk of ordinary text, you're also getting the HTML code embedded beneath that text. Consequently, when you go to paste your Web-sourced content into a word processor, blog tool, desktop publishing program, or the like, you may end up with text with odd fonts, sizes, and/or formatting. And you may have a hard time fixing that text--especially the line spacing, indent, etc. That embedded HTML code (which can be extensive) will sometimes conflict with or override the settings you apply in your word processor or other app. What you need is way to paste just the words you copied, just raw, unadulterated, code-free text. Thankfully, you can, thanks to the Paste Special command. Of course, Microsoft Word 2007 and 2010 lack the traditional Edit menu, so you'll have to look elsewhere. The Paste option lives on the left edge of the Home tab, but don't just click that clipboard icon; click the bottom half of the button, the one with the down arrow. 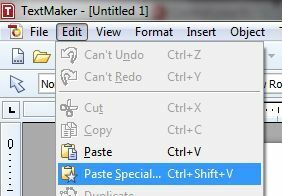 That'll produce a handful of Paste options, one of which is Paste Special (represented by a clipboard with a bold letter A). Once you get in the habit of using Paste Special, you'll wonder how you ever got along without it. What Are All Those Different Document Formats? By default, Microsoft Word uses its own, proprietary document format. In the old days, that was the .doc format, but as of Word 2007 (and continuining with Word 2010), it's .docx.